At Door Systems Worcester, formerly Raynor Overhead Door, we have been proudly serving our community since 1989. With our four locations, we pride ourselves in providing excellent customer service. We guarantee our quality residential and commercial garage doors will be beautiful and weatherproof for many years to come. In order to best serve our clientele, we carry the best garage door brand on the market: Garaga! 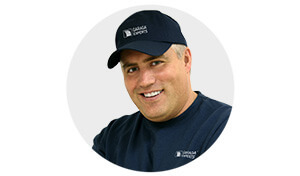 As industry leaders for decades, Garaga provides an extensive selection of garage door designs. These customizable doors allow you to select the right color, style, insulation, and hardware for your home or business. For more information on Garaga garage doors please visit our image gallery. At Door Systems Worcester, it’s our mission to help you find the right door, at the right price. Let us guide you through your overhead door buying experience. Call us today at 508-752-4677 or visit our showroom for expert advice. Prefer to browse online? Complete our online quotation form for a free estimate. An overhead door is typically the largest moving part of your home. It’s also the heaviest. For the safest, most reliable overhead door possible, complete your setup with a garage door opener. Here at Door Systems Worcester, our technicians will install your new opener for you, ensuring a safe finished product. Since our clientele has told us quality, price and reputation are important to them, we always recommend LiftMaster door openers by Chamberlain. Engineered for excellence, LiftMaster offers the best safety features. A new Wi‑Fi opener allows you to operate your garage door anytime, from anywhere. Get real‑time alerts, or pre‑set your daily schedule to make sure the lights are always on when you arrive. At Door Systems Worcester, formerly Raynor Overhead Door, we carry various garage door openers designed for residential or commercial applications. A full list of features and accessories is available on our door opener gallery. Contact us today and our experts will help you find the model that best suits your garage door. We understand the importance of a professional garage door installation, done by a Garaga Expert. For your peace of mind, all of the technicians at Door Systems Worcester are fully trained employees – we don’t use subcontractors. Since we do both residential and commercial installations, our technicians are fully qualified in both areas. At Door Systems Worcester, we offer 24h emergency service. Our four locations have fully staffed offices and showrooms to better serve you. Is your garage door in need of a tune‑up? Keep your door in perfect condition with our preventive maintenance program. Our technicians will inspect, repair and maintain your entire garage door system to ensure it is safe and running smoothly. Door Systems Worcester, formerly Raynor Overhead Door, has been specializing in garage doors in the Shrewsbury, Worcester, and Westboro area for over 35 years. Our second location, Southbridge Overhead Door, serves the Western MA & Northern CT areas. Our newest location, Lynch MetroWest Doors, is based in Marlboro, MA and serves the Concord, Sudbury and Wellesley area. We also acquire PJ Overhead Door. Worcester, Auburn, Charlton, Webster, Southbridge, Sturbridge and surrounding areas. This web site is not endorsed by, directly affiliated with, maintained, authorized, or sponsored by Raynor Manufacturing Co. of Dixon, Illinois or its Raynor trademark. All product and trade names are the registered trademarks of their original owners. The use of any trade name or trademark is for identification and reference purposes only and does not imply any association with the trademark holder of their product brand.